When handling small and sensitive components, good grip is important to allow you to do your job as efficiently as possible. 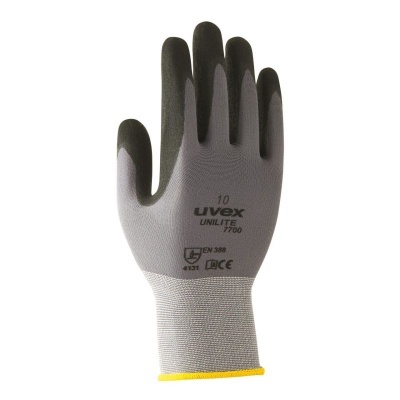 The Uvex Unilite Flexible Lightweight Safety Gloves 7700 are lightweight and flexible, giving your hands excellent dexterity, while their nitrile rubber and polyurethane coating ensure outstanding grip in dry, damp and oily environments. The Unilite Flexible Safety Gloves 7700 are available in five sizes that should suit the hands of most users. Please measure the circumference of your hand around the knuckles (excluding the thumb) with your hand open and your fingers together, and the length of your hand from the tip of your middle finger to your wrist.